The techcrunch article tells us that Google is working on suggestions for developers to have their events listed in search results – so we should be keeping an eye out for those as they get published. 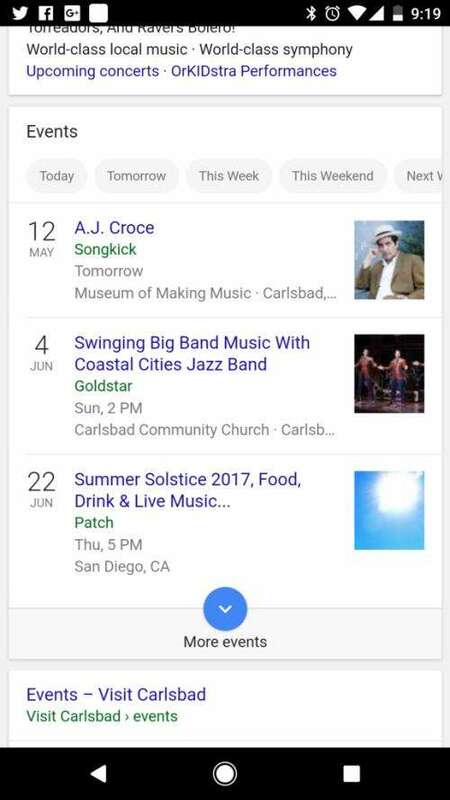 I wrote about a patent here, in a post in November that talked about Ranking Events in Google Search Results, which focused upon a Google patent that had been granted August 23, 2016 titled Ranking events. This Events Finder is available in the United States starting today; but the Techcrunch article tells us that there are no plans for international expansion. I suspect that this new events finder might get a lot of use from people looking for something to do. I like that it is including events from local schools and museums. It really looks useful. Didn’t see it here in Edmonton, Canada – tried sports and music – will keep an eye out. The techcrunch article said that it was limited to the US today, with no plans for an international release. So, no telling if you will see it anytime soon. Tried this from Redmond, WA. Works Great! I would like to encourage all of you really like your blog. Did you design this website yourself or did you hire someone to do it for you? Plese reply as Iâ€™m looking to create my own blog and would like to find out where u got this from. many thanks bookmark this page to your most used service to help get the word out. Thank you. I do appreciate comments that I receive. I designed this site myself. I used the Genesis Theme to build it. Sounds like a great feature, Thanks Bill for keeping us up to date with new Google features, your blog is my go to SEO for all the Google related news. Google is certainly trying out new projects in the UK. Today I noticed in Google Images, I get a lovely colourful display of keywords. I can already see many ways in how the events feature would help companies, charities or local organisations once fully rolled out. Thanks for sharing your content here. Good to hear. I was impressed with the results I’m receiving here in San Diego – liking that they come from Schools, and Museums and meetups. I’m finding that I am checking them frequently. Got me excited for a second there since it really does sound useful. Then I checked the comments and went on to read the Techcrunch article. The Google-does-not-yet-have-plans-for-an-international-expansion-part was what bummed me out. Would sure love to read updates if you come across any. Pretty neat. Canadians, throw on a VPN like IP Vanish and do some googling. It’s pretty neat. There’s a few other features in Google that aren’t available here. That’s really an interesting feature. As consultants often have to travel, this feature could help a lot with the extra time. If I see anything that indicates that Google might make this international, I will update it. Doesn’t seem to be working from here in the UK right now but I think this is a really good addition to the Google arsenal. I can’t wait to see what’s going on around me when I’m looking to take the kids out for the day. Great stuff as ever Bill, keep it up! I’m not sure if it will become available outside of the US. The announcement says it is US only. I agree that it is a good addition to what Google does. Unfortunately, it doesn’t look like it is going to be released internationally. I hope that Google does decide to release it beyond just the US. Interesting update though it’s not available in India yet. But hope it will be here soon. That’s an interesting fact! A very new update in Google’s armory. Thanks for sharing. I’ve been keeping an eye out for something new on the Google developer’s pages; I’ve seen nothing yet. 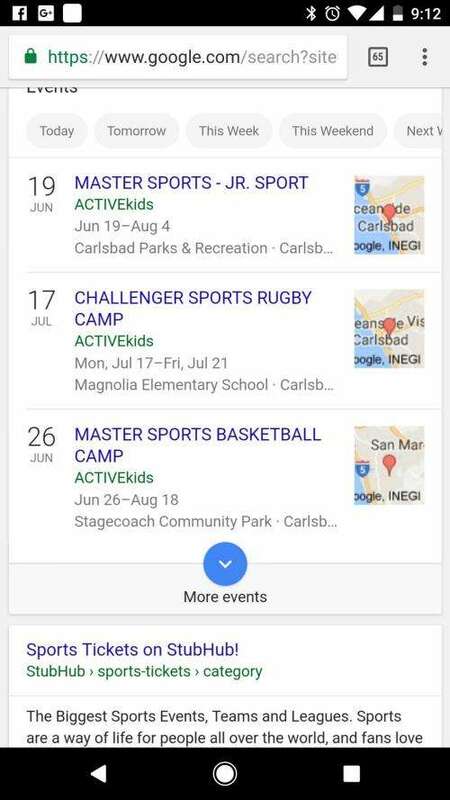 There is schema markup in the developer’s pages which can lead to event information appearing in search results that are relevant and appropriate for a query; but not for the kinds of event searches described by what Google has told us about this new events search feature. I think it is worth keeping an eye open for. I am always looking for something new related to SEO. though I found it that’s new to me. I really want to know that how I can gear up myself with news updates. It would help me a lot to visit your site. thanks for sharing. Previous Previous post: Will Google Start Giving People Social Media Influencer Scores? Next Next post: Authoritative Search Results in Google Searches?